Designation: Faculty of Science, Dept. of Materials Technology Ramkhamhaeng University, Thailand. Research Interest: Zeolite: synthesis and applications, Biomaterials: synthesis and applications, Green materials and waste utilization, Membrane and separation, Electrospinning technique, Clay based materials and applications and Rubber technology. 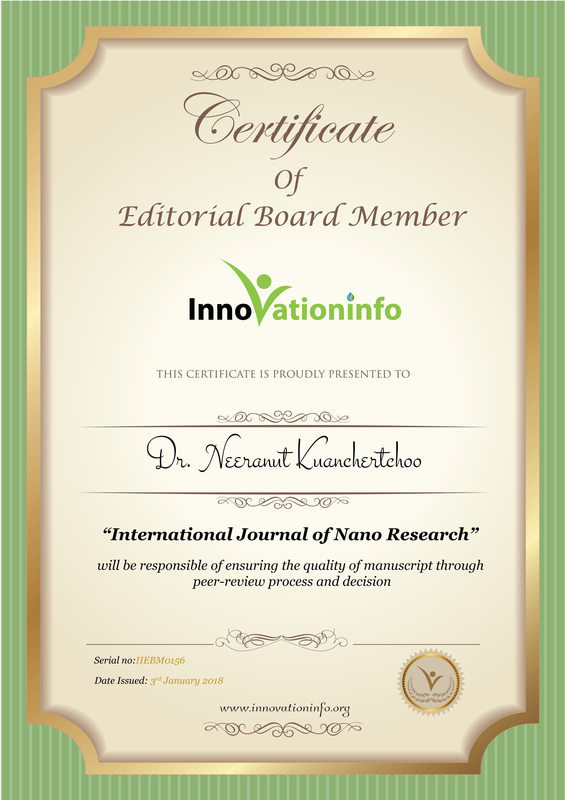 Biography: Dr. Neeranut Kuanchertchoo is currently working as Faculty of Science, Dept. of Materials Technology Ramkhamhaeng University, Thailand. 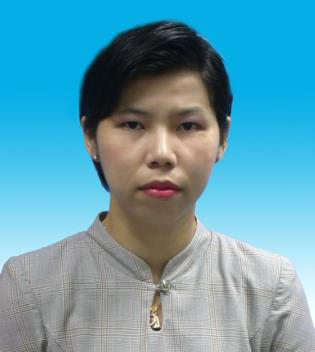 She obtained her Ph.D. in Polymer Science from Petroleum and Petrochemical College, Chulalongkorn University, Thailand. Her M.Sc (Ceramic Technology) from Chulalongkorn University, Thailand. She has over 9 publications in peer reviewed journals, 16 conferences and two patents. 1.Choochaisangrat, T., Powduang, T., Kuanchertchoo, N., and Kashima, D. P. 2015. Effect of Crystallinity of Hydroxyapatite Nanoparticles Prepared from Bovine Bone on Adsorption of Ammonium Gas. Key Engineering Materials. 659: 289-293. 2. Kunnakorn, D., Rirksomboon, T., Siemanond, K., Aungkavattana, P., Kuanchertchoo, N., Chuntanalerg, P., Hemra, K., Atong, D., Kulprathipanja. S., James, R. B., and Wongkasemjit, S. (2013) Techno-economic comparison of energy usage between azeotropic distillation and hybrid system for water–ethanol separation. Renewable Energy. 51: 310-316. 3.Kuanchertchoo, N., Jarupalee, A. and Wongkasemjit. S. 2013. Synthesis of NaA Zeolite Using Surathanee’s Ball Clay as Si and Al Source and Using Secondary Growth Technique. (in Thai version) Journal of Ramkhamhaeng Research. 17(2) 1-15. 4.K-hasuwan, P., Kuanchertchoo, N., Wetprasit, N., and Supaphol, P. 2012. Mesoporous hydroxyapatite /ovalbumin heterocomplex particles: synthesis and characterization. Materials Science and Engineering C. 32: 758-762. 5.Kunnakorn, D., Kuanchertchoo, N., Kulprathipanja, S., Aungkavattana, P., Atong, D., Hemra, K., Rirksomboon, T., and Wongkasemjit. S. 2011. Optimization of synthesis time for high performance of NaA zeolite membranes synthesized via autoclave for water-ethanol separation. Desalination. 280: 259-265. 6.Kunnakorn, D., Rirksomboon, T., Aungkavattana P., Kuanchertchoo, N., D. Atong, Kulprathipanja, S., and Wongkasemjit. S. 2011. Performance of sodium A zeolite membranes synthesized via microwave and autoclave techniques for water ethanol separation: Recycle-continuous pervaporation process. Desalination. 269: 78-83. 7.Kuanchertchoo, N., Kulprathipanja, S., Aungkavattana, P., Atong, D., Hemra, K., Rirksomboon, T., and Wongkasemjit, S. 2008. Synthesis of NaA Zeolite Membranes: Comparative Study of Microwave, Autoclave and Electrophoretic Techniques. Journal of Ramkhamhaeng Research. 11(2): 17-25. 8.Kuanchertchoo, N., Suwanpredee, R., Kulprathipanja, S., Aungkavattana, P., Atong, D., Hemra, K., Rirksomboon, T., and Wongkasemjit. S. 2007. Effects of synthesis parameters on zeolite membrane formation and performance by microwave technique. Appl. Organometal. Chem. 21: 841-848. 9.Kuanchertchoo, N., Kulprathipanja, S., Aungkavattana, P., Atong, D., Hemra, K., Rirksomboon, T., and Wongkasemjit. S. 2006. Preparation of Uniform and Nano-sized NaA Zeolite Using Silatrane and Alumatrane Precursors. Appl. Organometal. Chem. 20: 775-783.